First dive certification in June 1976. Started underwater photography 8 years later with a housed minolta camera. Use a Nikonos V with 12mm Sea & Sea lens or 15mm Nikkor with dual Ikelite 150 strobes. In July 2014 started with Canon digital and 15mm lens in Ikelite housing. 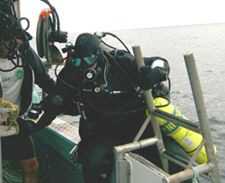 Dive experience, some of which is work related, includes both coasts of Canada, the Arctic and Great Lakes. Maritimer at heart, lived, worked and dove in Nova Scotia, Canada for 26 years. Moved to Ontario (Aug 05). The diving in the Great Lakes is excellent, but still drawn to the underwater wrecks and history of Halifax.